Savvy bloggers are turning mere concepts into the building blocks of a media empire. On January 18, Christian Lander posted the first entry of his self-explanatory (not to mention self-effacing) blog Stuff White People Like. Less than two months later, The New York Times was writing about his book deal with Random House that included a rumored advance of $300,000. The internet has made it possible for almost anyone to start a business. But beyond that, the proliferation of blogs means that now, more than ever, an idea in and of itself can become a business. And done right, a blog can become much more than a book deal--it can become the cornerstone of a web-based empire. "It all boils down to whether the writer is very good," says Ron Hogan, another blogger-turned-author who's been running beatrice.com, a website about the publishing industry, since 1995. "Plenty of people can get a one-book deal based on buzz, but if they don't have the chops to make a good book out of the concept, it's going to fall flat on its face. I've come to think the blogging sensation is not all that radical a sensation. I think back to the days before the internet, when syndicated newspaper columnists got book deals. Some of them could hack it and some of them couldn't." Hogan explains that, even in its relative infancy, the blog-to-book phenomenon has occurred in two distinct eras. The first involved publishers scooping up popular blogs in their purest form and publishing them as the authors' memoirs. The latest involves using blogs as platforms for concepts, and Hogan says the underlying cause of the most recent flood is fairly mundane. "Certain websites get passed around in publishing all the time," he says. "Like any office, we're chained to our computers for eight hours a day, and a lot of that time is spent surfing the web. Stuff gets passed around, and I'm sure hungry editors and agents have some section of their brain dedicated to keeping their eye out for the next big thing." By the time he was in college, Frank Warren says he'd already failed at more businesses than most people have attempted. But by the time he started the blog-based art project PostSecret he had also already succeeded, something he says was one of the keys to his blog's success. "Here's the paradox: I don't think of PostSecret as a business," says Warren, 44, who lives in Germantown, Maryland, with his wife and daughter. "I feel like the project found me at a point in my life where, financially, I had reached a certain degree of independence. That meant I could make decisions based on the best interests of the project itself." 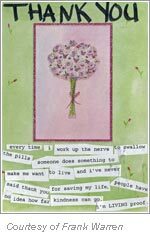 PostSecret started in 2004 as an art project that invited people to create anonymous postcards bearing personal secrets and mail them to Warren, who publishes them once a week as a blog. The project has since spawned four compilation books, all of which have been New York Times bestsellers, for a total of more than a million copies in print. 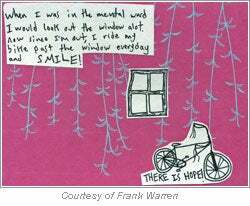 As part of PostSecret, Warren also visits seven or eight college campuses every month, speaking to students and allowing them to share their secrets publicly. He says it's a great way to combine the technological aspect of his blog with the basic human need to connect with others. "Blogs are these new forms of communication that allow us to have conversations we could never have before," he says. "A million people can share parts of their lives anonymously. This technology is so democratic. It's open for students, artists and entrepreneurs to play with. It allows us to uncover and recognize the beauty, humor and poetry that's underneath the surface and helps us understand that there's this unity under the surface that we forget in our everyday lives." For Warren, who has no artistic background, having created something so successful out of something so personal presents its share of moral and ethical dilemmas. He's refused advertising in favor of maintaining the site's strong philanthropic element. But he says his entrepreneurial background has allowed him to do so by structuring the site in a way that it can support itself financially while still staying true to the people who make it work. "I try to make these decisions in the best interest of the PostSecret community," he says. "It makes people feel like they can trust you. I never want to make people feel like I'm exploiting their secrets. Sometimes that means saying no to advertisers offering a lot of money. It's funny how you say no and it doesn't discourage them. It makes the property more valuable." So for Warren and PostSecret, the proof is in the paradox--the less he treats it like a business, the more successful it becomes. "When I was a kid, my greatest ambition was to make a million dollars," he says. "But as an adult, I've reached this surprising point in my life where the greatest satisfaction is being able to say no and know it's the right reason. That's better than making a million dollars for me." What if you could start a business based on customers who are so loyal, you could say just about anything you want without offending them, drive others to the competition and still make a healthy living, all with zero overhead? Welcome to the world of the political blogger. It can be a minefield, but it's one Markos Moulitsas has learned to navigate--to the tune of some serious profits. "I make a good enough living that, as long as I don't get greedy, if I write something that pisses someone off and they storm off, it's not a bad thing," says Moulitsas, creator of DailyKos, a left-leaning political blog network that found its niche as a foil during the height of President George W. Bush's popularity in 2002. "One of my mantras is that if you don't find what you want here, you can find it somewhere else. I wouldn't want to monopolize my niche. That's pressure. From a business standpoint, it doesn't make a lot of sense, but it makes my life easier." After turning down earlier offers from advertisers, Moulitsas finally agreed to sell ads in 2004, when his traffic was at its peak because of that year's highly charged presidential election. But before he made his final decision, the 36-year-old Berkeley, California, resident polled his readers. The ability to interpret the results directly created a built-in safety net against user backlash. "It came back 80/20 saying, 'Do what you have to do to make money,'" Moulitsas says. "That 20 percent, had I done it unilaterally, would have been the loudest about my being a sellout. They can't accuse me of being a sellout because the community gave me permission." The 30,000 users who gave Moulitsas their blessing in 2004 now inhabit a site that, according to alexa.com, averages about 15 million page views a day and is also home to an executive editor, two full-time programmers and a business manager. For those who'd still rather see the site without advertising, DailyKos offers paid subscriptions. But, Moulitsas explains, on a site with subject matter as pointed as his, the ads often fall in line with the rest of the material anyway. "Most of the ads enhance the site's content," he says. "If they're ads that speak to things people are already talking about, it actually supplements in a way that I wouldn't have expected when I started accepting advertising. It makes it harder to sell. I wish that wasn't the case. It's clearly lower than if I were a tech blog. But it is what it is. It's pretty cool, and I don't want to be greedy about it." In the absence of lucrative corporate advertising dollars, one thing Moulitsas has done to further the success of DailyKos has been to focus on the niche he discovered six years ago and create a distinctive brand, something he says has been a key factor in the site's expansion. "For me, it was my uncompromising voice that didn't exist in the media landscape at the time," he says. "But it was also my knowledge of technology, building a site that was focused on expanding and catering to the community. DailyKos is now known in blogging circles as 'Big Orange' and 'That Big Orange Satan.' That was on purpose. I wanted something, that if people saw it, they would remember. I didn't invent any of it, but I adopted these things. That's what really allowed DailyKos to take off." In addition to creating that lasting brand, Hogan says a lot of Moulitsas's larger-scale success comes from using the power of his community to reach a broader audience. "Politics is sort of a blue-chip subject in the blogosphere," he says. "You can attract a huge audience online talking about politics because everyone wants to fight about it. Or when you find someone who agrees with you, everyone wants to cluster around that. It turns them into a recognizable brand, at least within their audience. The trick is taking someone who is able to attract that niche audience and bring them out to a wider demographic." One look at the opening salvo of Tucker Max's bio (We can't even print it here.) will tell you all you need to know about him. The 32-year-old Kentucky native has somehow managed to merge self-promotion and self-deprecation; and whatever you want to call the result, it works. Max became one of the pioneers of blogging for profit in 2002 when his website debuted, featuring a girlfriend application that landed him on an MTV special about online dating. Loyal fans have been reading his stories of, among other things, unwitting applicants ever since. On the surface, he's like most other bloggers, except that instead of complaining about his middle school gym teacher or writing pretentious, self-absorbed poetry, he's cutting a swath of drunken depravity across the internet. "I had been writing funny e-mails and other things my whole life, but it wasn't until about a year after law school that I considered being a writer for real," he says. "I started a bit down that path, but I made the mistake most writers make--I wrote the way I thought I was supposed to instead of in my authentic voice. My friend sat me down and told me to just write about what I knew best: short stories about drinking and hooking up. Turns out that's what I liked writing best, so it was easy. From there, I kind of formulated my strategy as my career developed. I saw opportunities and exploited them." In 2006, Max published his first book, I Hope They Serve Beer in Hell, a collection of stories from his website along with some original material. It has sold more than 300,000 copies and spent more than 50 weeks on The New York Times bestseller list. His second book, Assholes Finish First, will be released next year along with an independent movie based on his first book. In the face of his rapid expansion into mainstream media and business success, Max says the most important factor in maintaining that success is to stick to the voice of his online roots. "Authenticity is the key," he says. "It's the entire reason people read me, and if I lose that, they have no reason to keep reading. That's the beauty of the internet--you can't hide. There are no monopolies anymore, so if you want an audience, you have to consistently provide them with value. Otherwise, they'll go somewhere else." In addition to his writing projects, Max serves as CEO of Rudius Media, a network of bloggers he created as part of his ongoing quest to mine quality content, which--unlike Hogan--he says is far more important than concept or even good writing. "There are a ton of concepts that die on the vine because of poor execution, and lots of great writers who have nothing to say because no one cares. What is most important is whether you are keeping someone's interest, and you can't really do that with concept or writing alone. How do you create great content? I think it's by focusing on the things you love, and writing about those things." Overall, Max says the basic principles of turning a blog into a successful business are no different than with any other business venture. "I've already picked my path, but if I hadn't, I can think of at least 10 other businesses I could start tomorrow," he says. "Plainly put: There is more opportunity out there than there are entrepreneurs. Pick a field you like, study it and then make it better." In a market that has the potential to become quickly saturated, Hogan says the key to transcending from book to business is about creating a unique brand. "Tucker Max is an example of persona as brand," Hogan says. "He's clearly created a larger-than-life personality with the idea of becoming an icon. The key to doing that is to do something no one else is doing or you take what people are doing and you crank the dial up to 11 so that nobody's doing it the way you are. There are plenty of blogs about guys going out and drinking and getting laid every night. But none of them are doing it with the stylistic flair of a Tucker Max. Delivery is a key part of the model." It remains to be seen whether the blog-to-book wave will crash, but for now, it's clear that a savvy writer can ride it to long-term success. Either way, bloggers like Lander are banking on the idea that publishers will continue to gravitate toward their pre-packaged audiences. "That site grew a huge audience within the space of a month or two," Hogan says. "Publishers know they're not all going to buy the book, but they gamble on enough of them buying the book to make it worthwhile. "It really boils down to the strength of the concept. If any of us just walked in and said, 'I want to write a book about that,' they'd laugh at us."